Drawing with real-life Superheroes for Superhero Daughter Day was a real highlight for me. I am so proud to support the Tech Girls Movement, a non-profit organization promoting positive female information technology role models to encourage and raise awareness of technology career options for girls. I have been working with the founder, and inspirational women in STEM Dr Jenine Beekhuyzen (aka. Jewella Superhero), and her team to help girls “picture their ideas” by putting the A in STEAM! 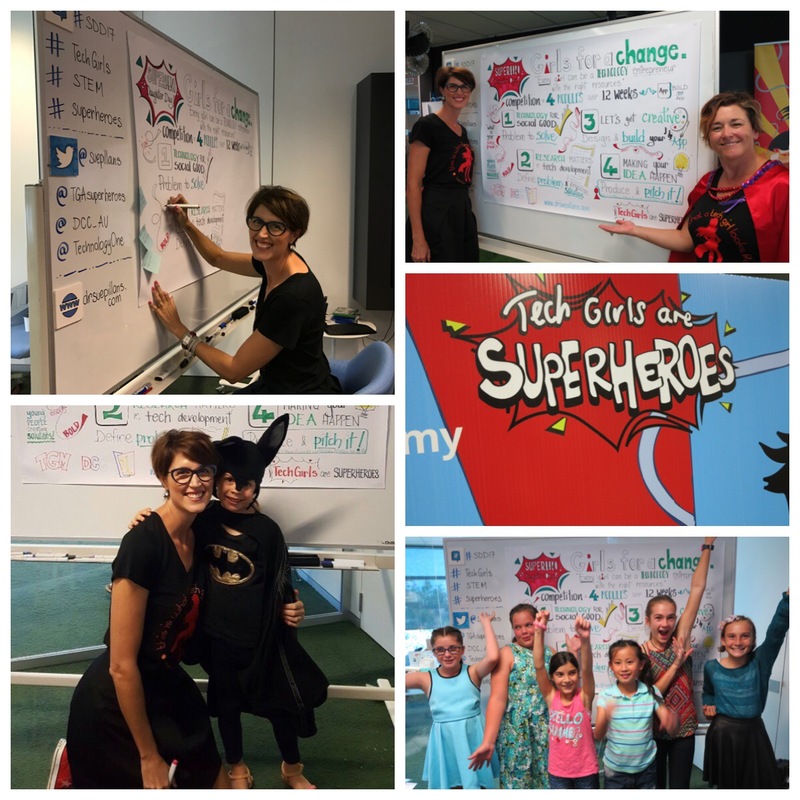 Superhero Daughter Day was all about girls having fun with their peers, meeting some cool female role models in IT and learning more about what life is like as a Tech Girl! As you can see from the photos there was a lot of excited energy and fun learning in the room of 300 girls and parents who learnt the ‘art’ of coding. This event was proudly supported by Diverse City Careers and TechnologyOne. I love drawing out ideas with organizations, groups, kids and parents and am so grateful for the opportunity to picture “Girls for a change”. KAPOW!! What is your SUPERPOWER!!? You can follow my creative journey via my alter ego Dr Suzie Starfish and @suepillans on Twitter and Instagram. ← The time is ‘write’ now!